On September 2 1989 anti-apartheid protesters marching on Parliament were stopped by police near this spot. They mounted an impromptu sit-in and police retaliated with tear gas, batons and a new weapon: a water cannon laced with purple dye to stain demonstrators and make them easier to identify and detain. As protesters scattered, one climbed onto the armoured vehicle with the cannon and turned the purple jet on police. Purple dye stained most of the surrounding buildings, including the National Party headquarters and the white-washed walls of the historic Old Townhouse. The next day graffiti all over the city proclaimed "The Purple Shall Govern". This was one of the last protest marches outlawed by the apartheid government. Eleven days later, 30 000 people marched through the city without police intervention. When more than 30 000 Capetonians took to the streets, transferring people’s power from the township to the city centre, it was against the backdrop of Cosatu’s factory-based and national political campaigns. Dene Smuts and Shauna Westcott’s book, The Purple Shall Govern: A South African A-Z of Non-Violent Action, deals with the Purple Shall Govern march in substantial detail. After being rounded up by police, protesters were released with no explanation, and in mid-October, charges were dropped against those arrested. The court was told it was the decision of the Attorney-General. The Purple March instigated a string of popular marches around the country. 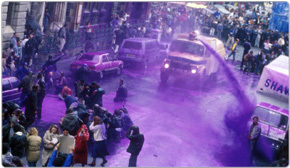 The Purple March emerged from the defiance campaign started in 1989 in response to a national state of emergency. Purple took on a powerful meaning during an anti-apartheid protest in Cape Town in the dying years of the dreaded Eighties. Phillip Ivey, the protester who turned the water-cannon on the police, talks about events that led up to the march on September 2, 1989. In a massive show of force, police yesterday cracked down on pre-election demonstrators in the biggest urban disturbance since the state of emergency was imposed three years ago. At an exhibition some time ago, one reviewer concluded that Conrad Botes was the spawn of Satan, while another thought he was a prophet. The two side by side images, Conrad explains, represent the different people who participated in the march and the sort of things that would have been in their pockets. "Why are they taking over our city? This is our city." In this lesson plan, learners will be able to compare personal accounts with a more detached report of the same incident. Very few photographs of the Purple March survived the police crackdown on the media at the demonstration. A selection of images of the Heritage Project’s memorial to the Purple Shall Govern march. Audio of The Purple March by people who were there. Listen to accounts of the Purple March by people who were there, including Philip Ivey, the young protester who turned the jet of purple dye on the police. 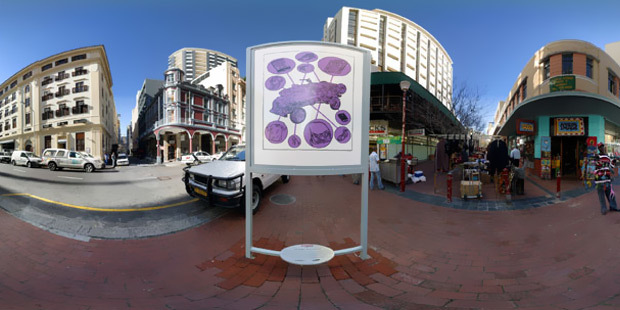 360° virtual tour of the memorial at the corner of Burg and Church Streets, Cape Town.